Above-the-line – Creative talent such as actors, directors, producers, and writers OR the part of the budget which includes costs and fees associated with the above talent. 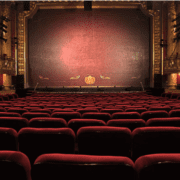 Actors Equity Association (AEA/ Equity) – A union that has jurisdiction over performers in live stage productions in theaters, such as Broadway and community theater. Agent – A representative of talent, petitioning on behalf of the talent for work within the entertainment community. Agents, by law, have the right to both solicit employment and negotiate terms for the artists they represent. Not to be confused with manager. Callback – A follow-up audition, after they have narrowed down the competition. Call Sheet – The daily schedule of a given production, listing “call times,” actors involved and scenes. Commercial Agent – an agent that represents talent for television commercials. This is not to be confused with a print agent which represents models for commercial print ads. Commercial Modeling – Otherwise known as Print Modeling, this is modeling done for print advertisements, catalogs, etc. Day Player – An actor who is paid a flat daily rate and generally only has a few lines in the production. Characters that appear in only one scene are generally played by day players. This is sometimes a “step up” for an extra who is asked to read a line on-set. Dailies – As the film is shot, production and development units view footage the following day. This film stock is known as ‘dailies.’ The producer, director, and various studio department head critically analyze the previous day’s results, looking for any visible problems, from wardrobe to set dressings and performances. In theory, dailies depict the progression of the film in relation to the course of production. Director – The principal creative artist on a movie set. A director is usually (but not always) the driving artistic source behind the filming process, and communicates to actors the way that he/she would like a particular scene played. A director’s duties might also include casting, script editing, shot selection, shot composition, and editing. Executive Producer – A producer who is not involved in any technical aspects of the filmmaking process, but who is still responsible for the overall production. Typically an executive producer handles business and legal issues. Extra – A person who appears in a movie where a non-specific, non-speaking character is required, usually as part of a crowd or in the background of a scene. Honey Wagon – A vehicle/trailer/truck containing dressing rooms and restrooms. Line Producer – The hands-on manager of a film set, the line producer organizes the practical aspects of production. Line producers and production managers are responsible for budgeting, scheduling, and implementation. Pilot -The first episode of a television show or cable show used as a “test run” amongst networks and producers before the show is greenlit. Pilot Season – The time between around January to about May when pilot episodes are filmed and tested and possibly given the green light to begin production. Pitch – The meeting held between key players of a film or broadcast literary work. In most cases, this is where the writer(s) attempt to ‘sell’ their product to the producers by explaining why their product should be made by that company into a motion picture. Slug Line – A header appearing in a script before each scene or shot detailing the location, date and time that the following action is intended to occur. Taft-Hartley – A federal statute that allows a non-performer to work in a union position without having to first join the union. It is in effect for 30 days from the first day of employment, after which the performer must join the union. Trailer – An advertisement for a movie which contains scenes from the film. Treatment – Similar to an outline, a treatment is one of the first steps in developing a project. It adds depth to character and story by filling in missing blanks. Walk-On – A small acting part which has no lines.